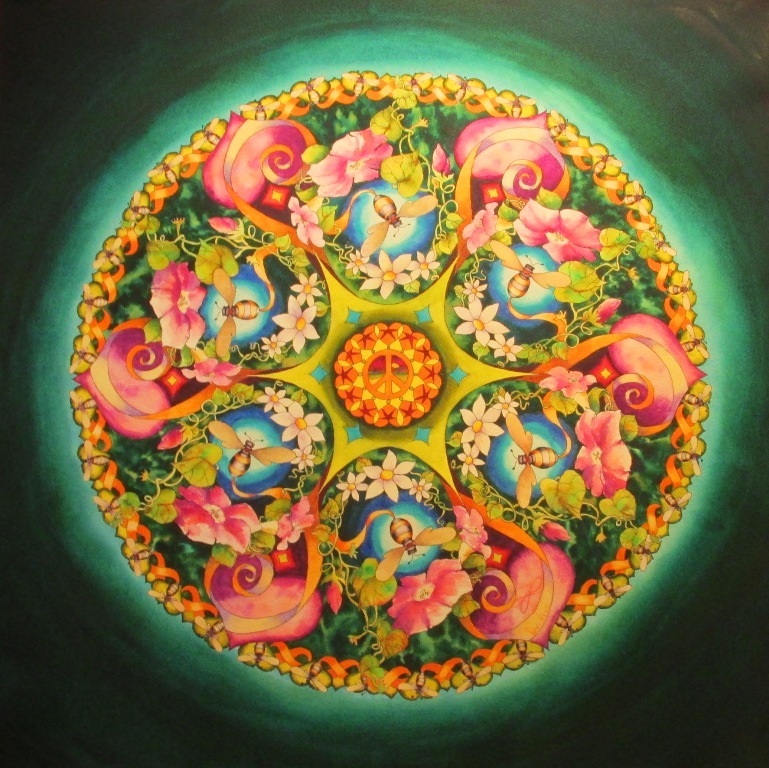 Let It Bee mandala…watercolor painting by Vikki Reed. 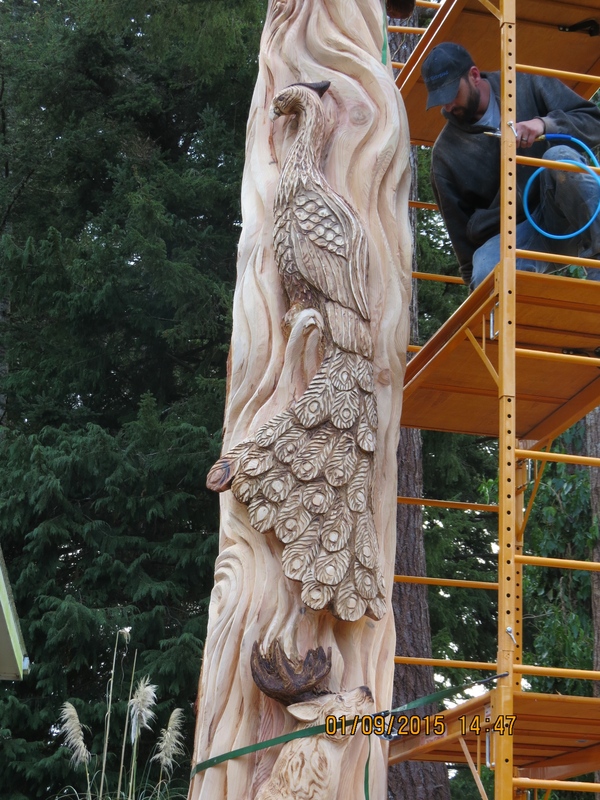 This is a short video showing how the mandala takes shape. No computer graphics either…it’s all hand painted watercolor. 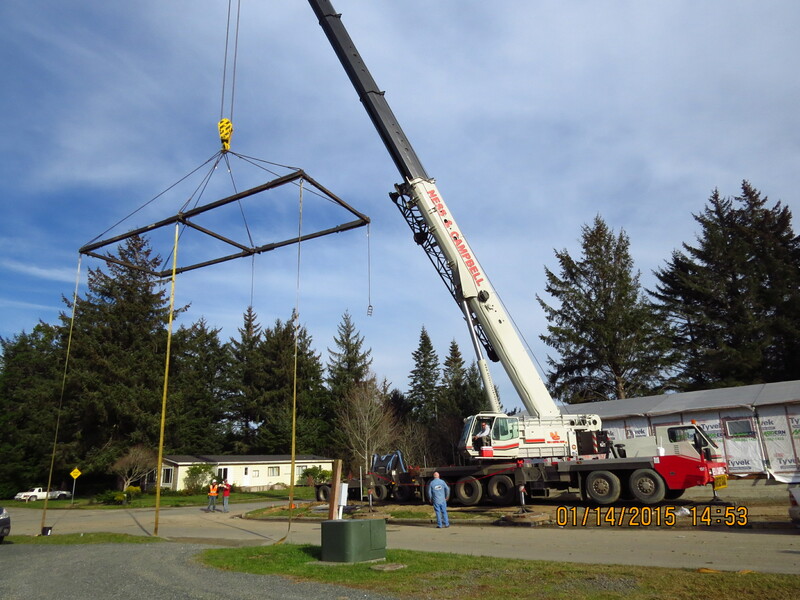 This crane is waiting to off load the last module of the medical office. and there’s the truck hauling the last unit to be set up. I’m lucky…the weather is great and I have time to shoot a video. How cool is that? 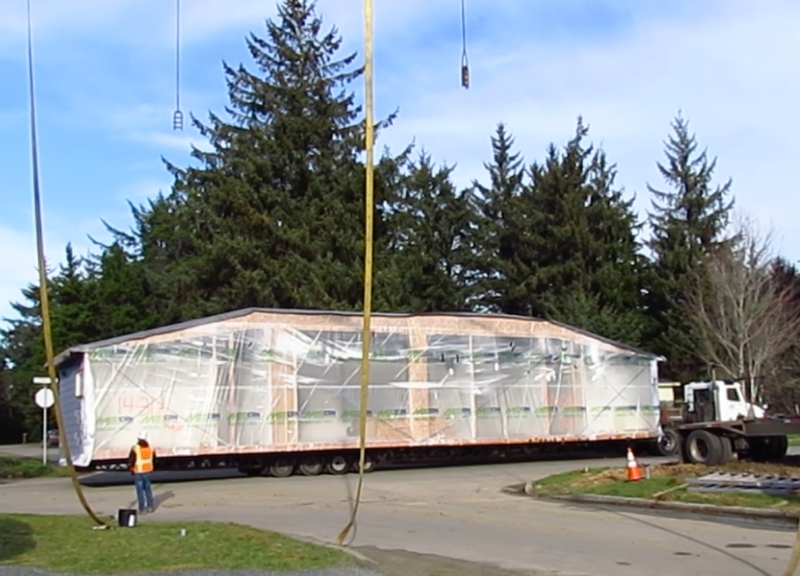 For the next hour I was able to shoot video of the Modern Building Systems crew rigging the module, the crane lifting the module off the truck, and swinging it into position. I’ve got to say I was impressed at how everyone knew what to do…and they absolutely nailed the placement of that module. I know, I’ve got it on video, corner lined up to corner, perfectly! 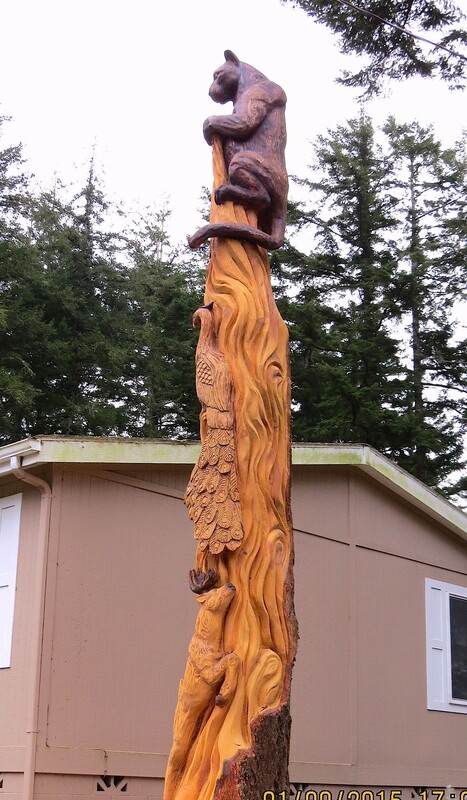 Side view of the totem shows how tall it is. 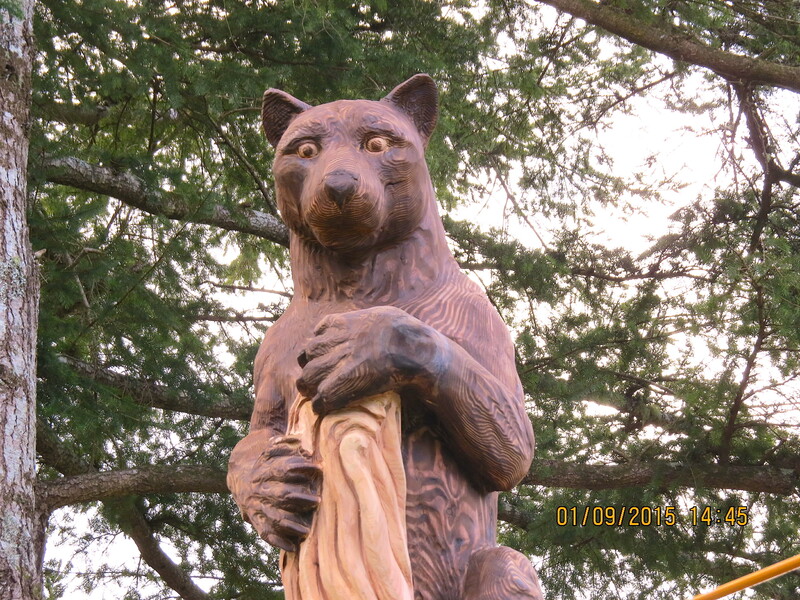 As I’m standing directly in front, it looks like the panther is staring right at me. 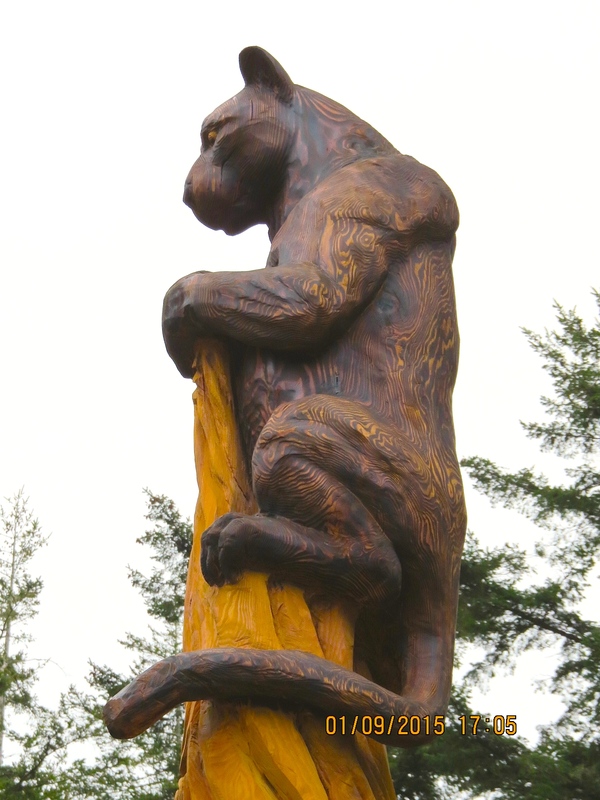 The panther was created by sawing wood from the tree, something that’s really hard to grasp for a non artist person like myself. You create something by taking something away. 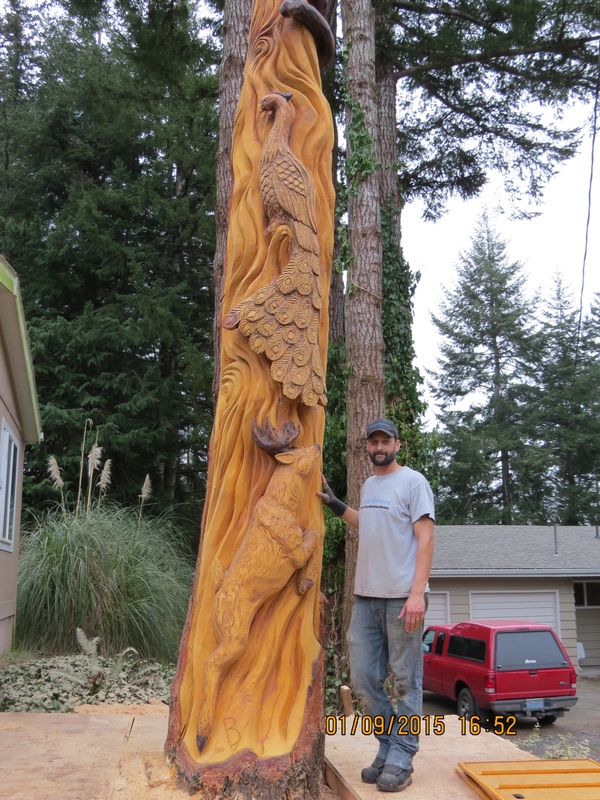 I should have been hollowing out my next log hive because Brian is going to carve the faces of my three grand kids on it next, but I just wanted to show you how talented he is. 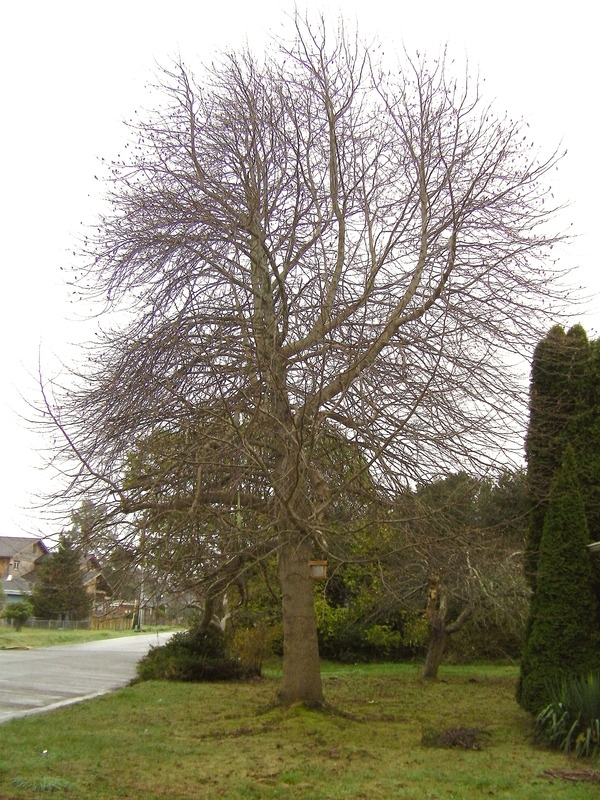 “All the leaves are gone, and the sky is gray.” For the last few weeks, every day when I walk past this tree, The Mamas And The Papas start playing that song in my head. 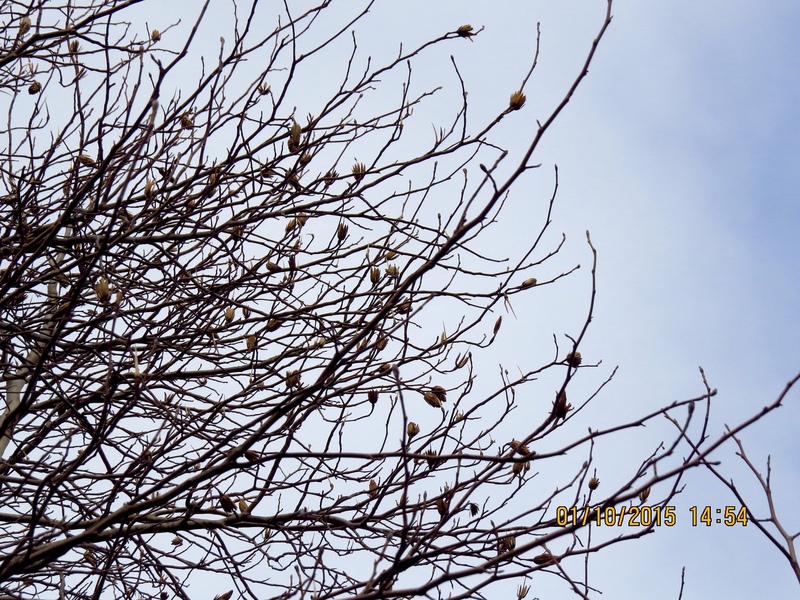 1-10-15…There are still many seed pods hanging on the tree. I’ve got a whole bag of them, so I won’t be needing these. 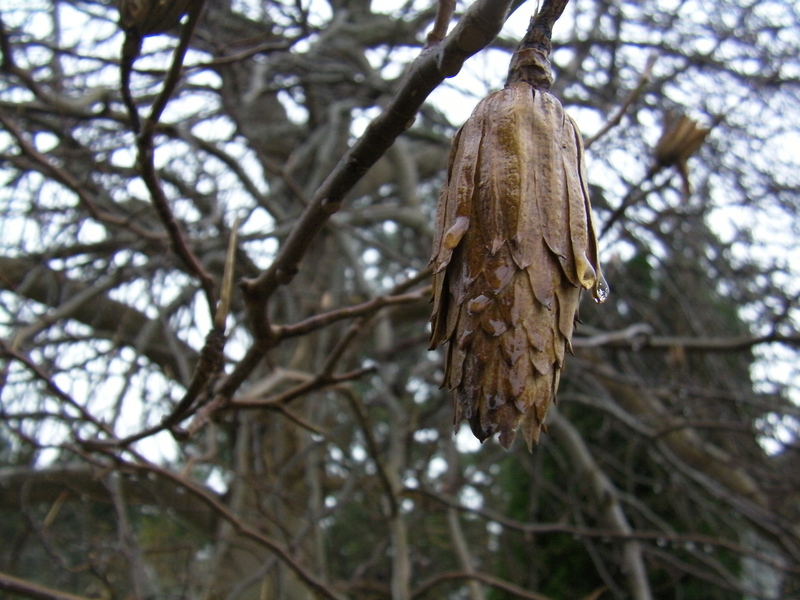 Close up view of a seed pod. Already a promise of things to come. 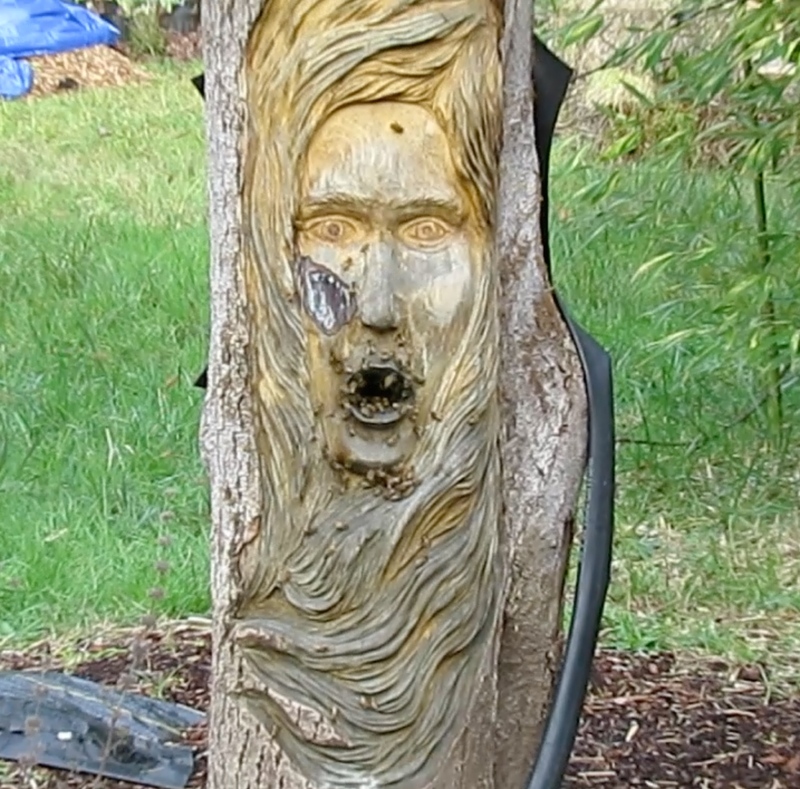 Many thanks to Lucy at Loose and Leafy for hosting the Follow a Tree blog. 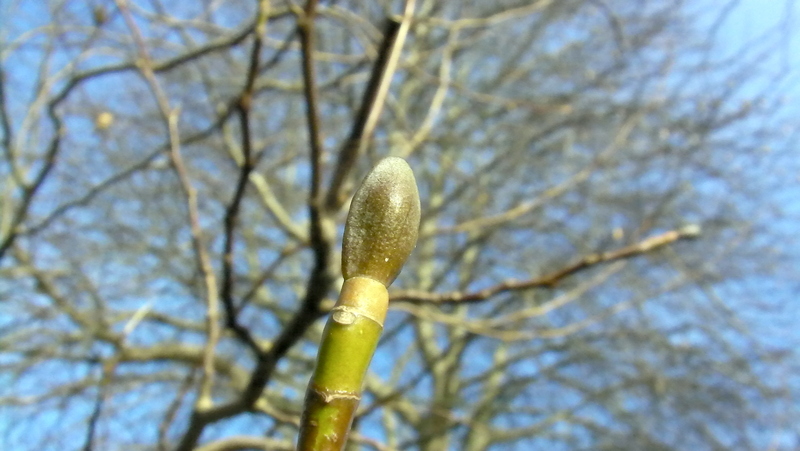 I have learned so much about this Tulip tree that I never would have learned if there had not been a deadline. 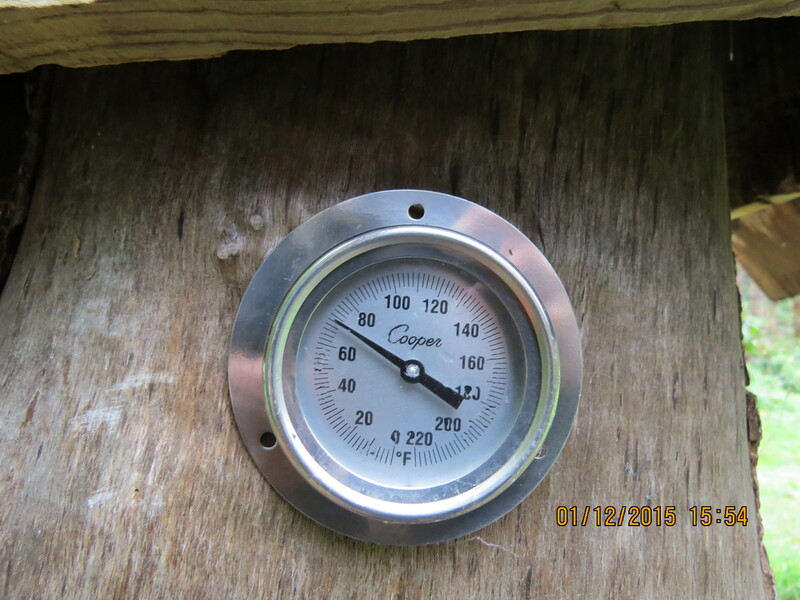 In Vernon’s words from January 5, 2015…For almost a month the activity at the entry of my newer hive has been near zero. At first I thought the colony was settled in for the Winter, but the weather has been mild and the older hive was still somewhat active. So today I opened the shutters and found that my colony had failed. Although there were a few dead bees left in the hive, it appears that the majority absconded. It’s a clear case of Colony Collapse Disorder. 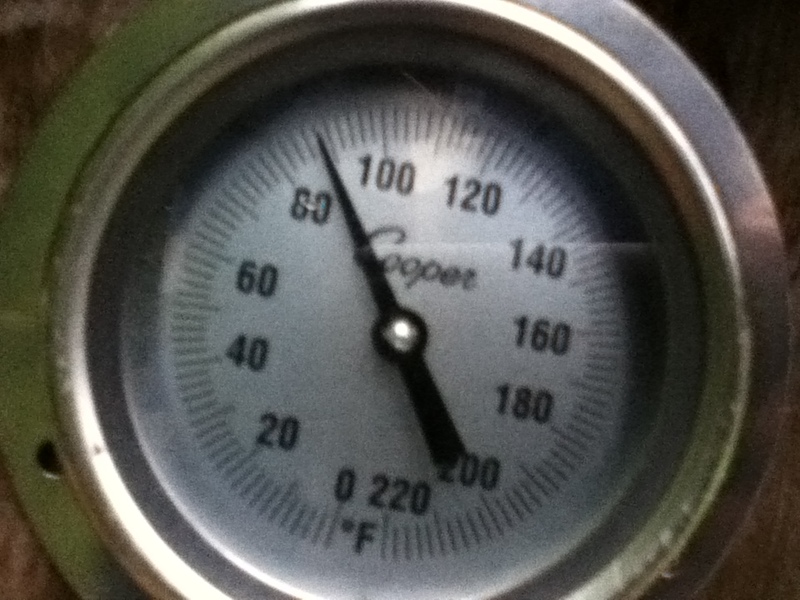 My heart is broken, but I decided to take some pictures to document the failure, in hopes of helping other beekeepers. 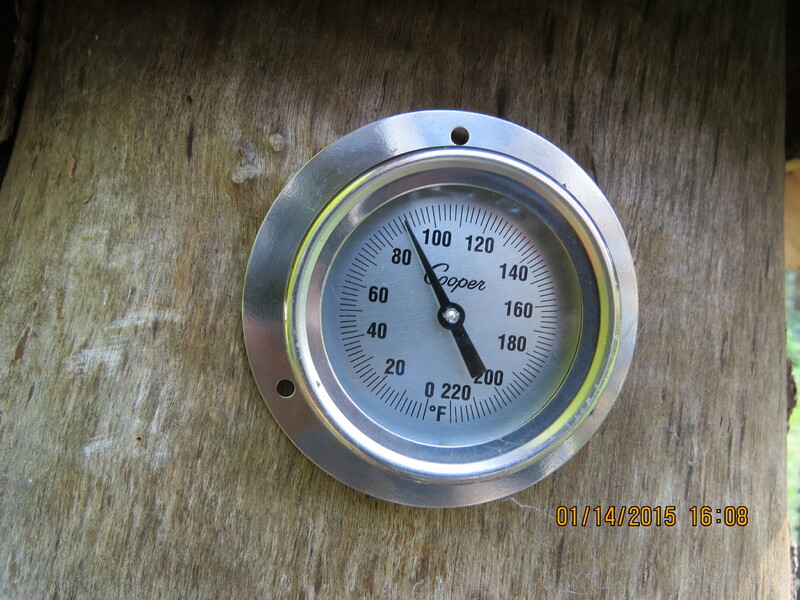 2015-01-05…It’s difficult to remove the comb from a Perone brood box. I broke two combs, which isn’t too bad. Maybe some of the local beekeepers will be able to help me do a post mortem. 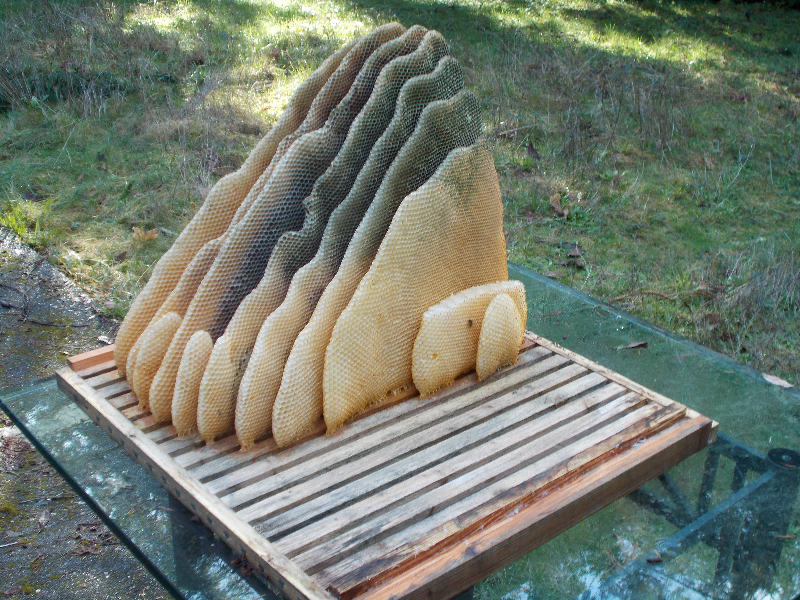 Some of the comb is very dark, almost black. Is that mold or mildew I’m seeing? 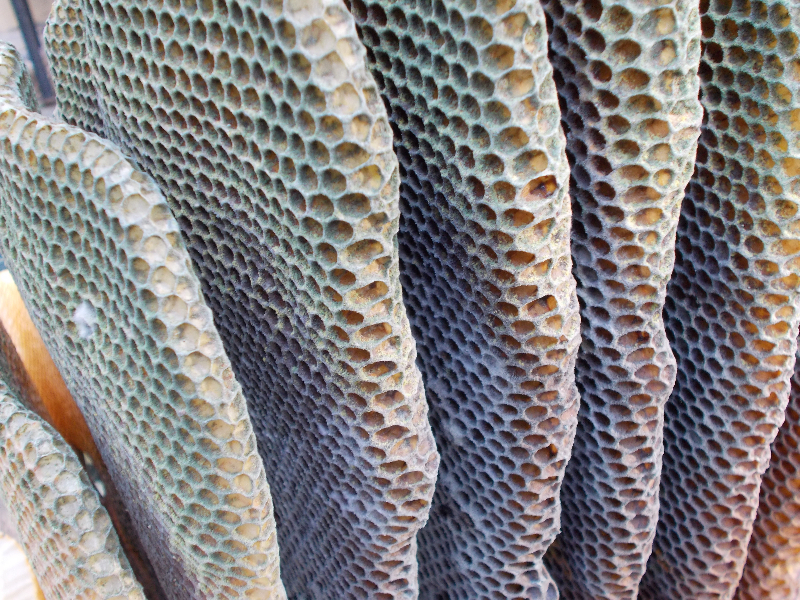 The spaces between the combs appears generally uniform. This close-up shows that most of the cells were empty, and the black substance was pervasive. Although this comb measures an impressive 19.5 inches in width, it was, in the end, non-functional. Most of the cells are empty, and those that are capped are covered with that black substance. 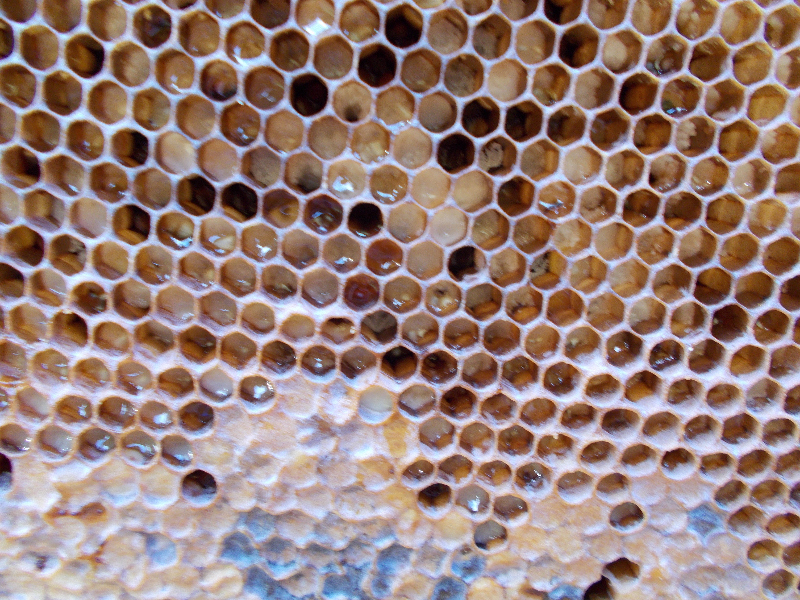 It appears that brood was developing when the colony absconded. 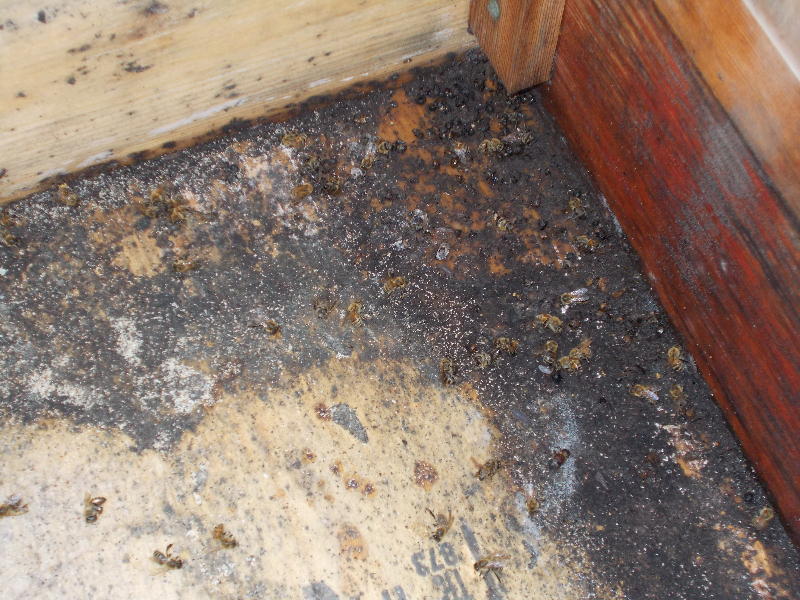 A few dead bees remain, but the most concerning thing about the floor is the black mold (or whatever it is). Close-up of the Black Death and some of its victims. 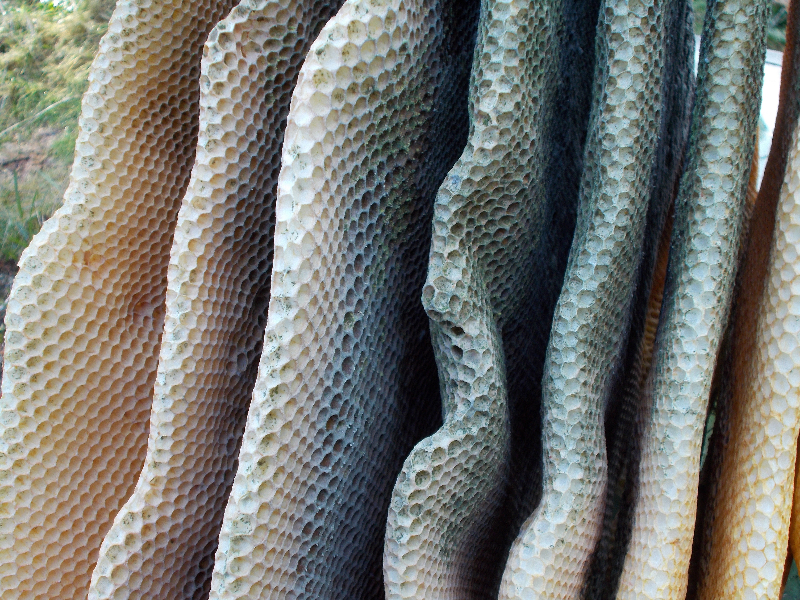 The hive was always very moist inside. Maybe next time I’ll slant the floor, or drill some holes, or make some other provision for drainage. A solitary worker clings in death to the comb she helped build and fill. You and your mates worked tirelessly, little friend, and I’m sure you’re all in bee heaven now. Hail and farewell! 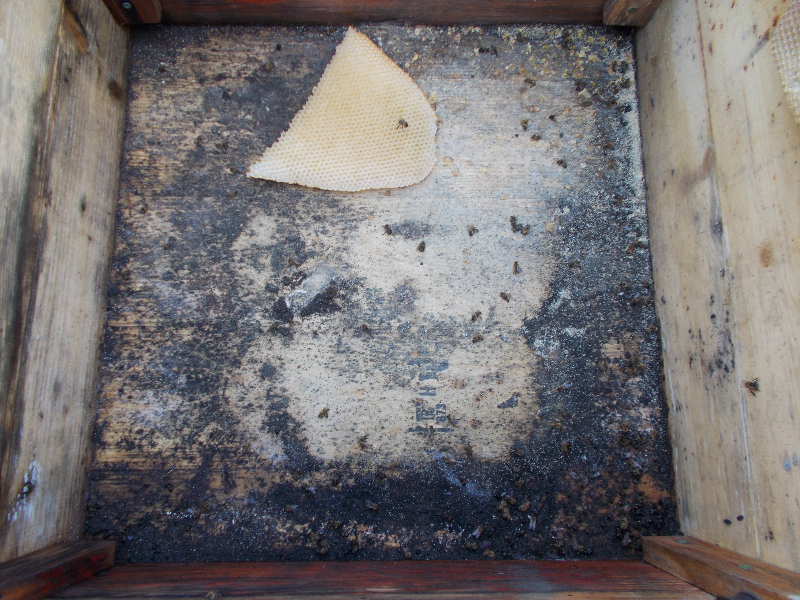 Vernon wrote yesterday his recent thoughts…”I’ve got a plausible hypothesis for the cause of this hive failure. 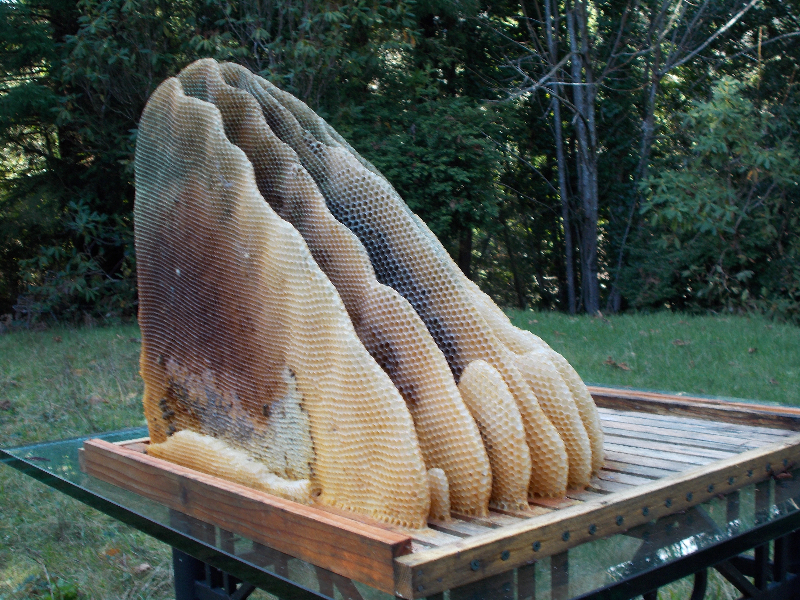 Some beekeepers equalize the populations of adjacent hives by trading frames. This is supposed to discourage robbing. 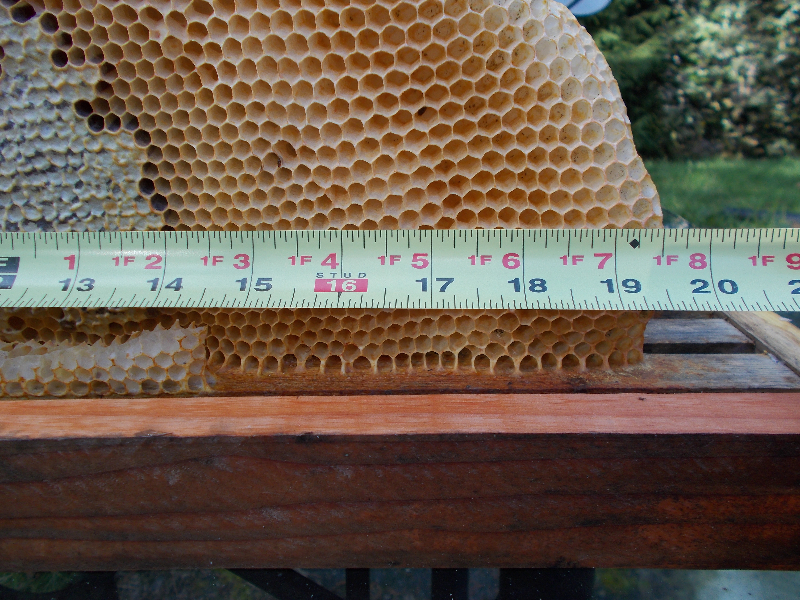 Early this Spring my Hive #1 probably had close to 100,000 bees. 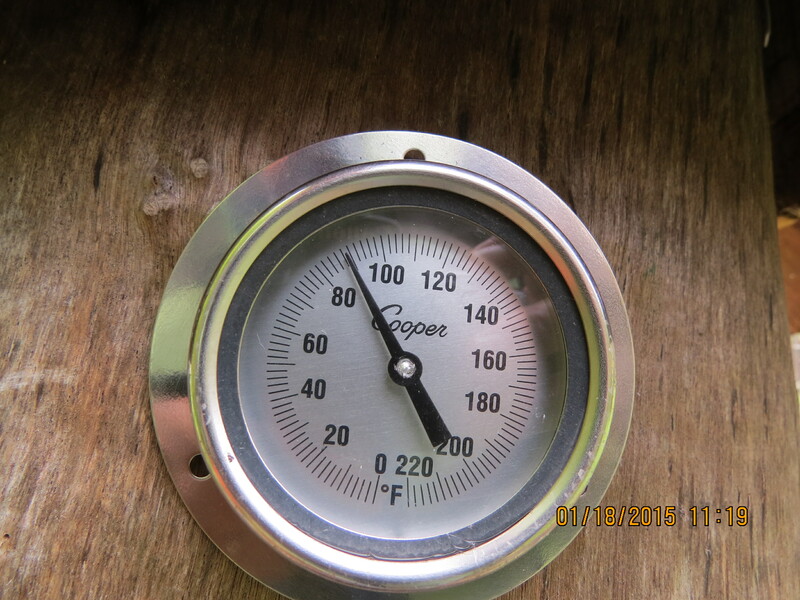 I located Hive #2 adjacent to it, populated with at most 12,000 bees from a 3 pound package. Not smart. Bees from Hive #1 were probably robbing Hive #2 from the start. 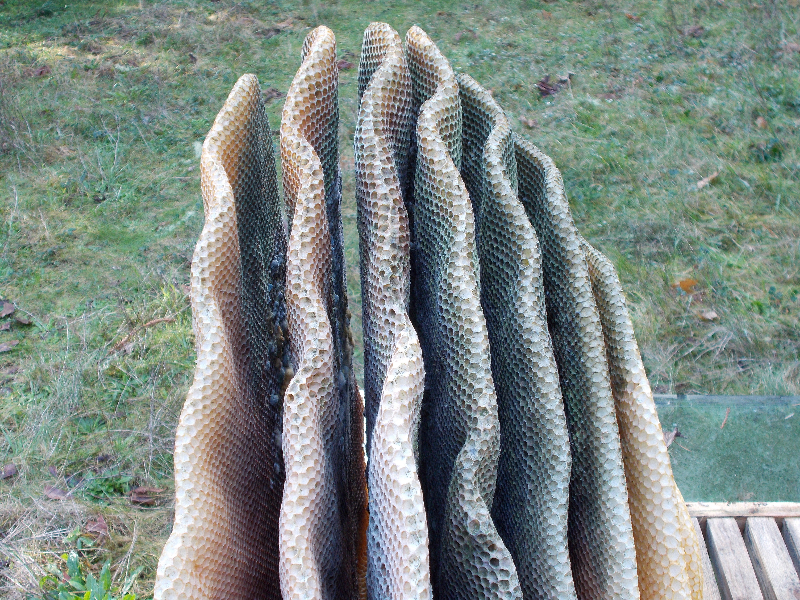 Going back over my old photos it’s clear that the new bees built a lot of comb that never got filled, even though they brought back a lot of food and produced a lot of brood. Wouldn’t that indicate robbery from their stores? Stocking the hive with package bees may have made robbing more likely. 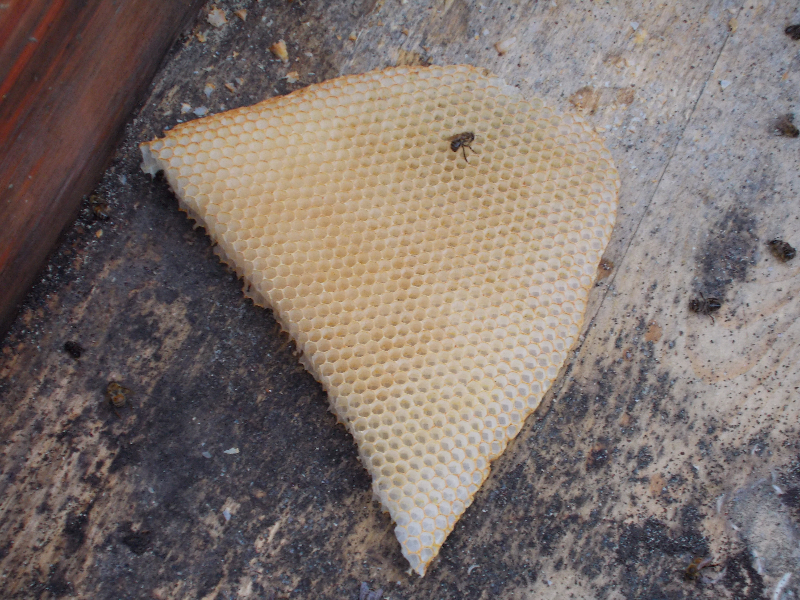 The queen was a Carniolan type and the workers were Italians, derived from a number of hives. The brood was Carniolan, so the Italian workers were nursing juvenile bees with a different pheromone signature. That may have desensitized the colony to the unfamiliar pheromones of bees from outside the colony.